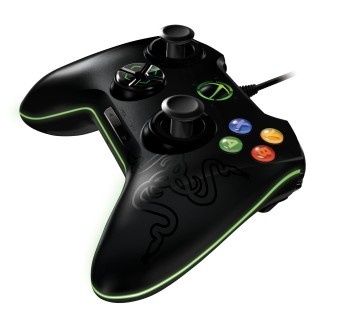 The new Razer Onza controller for the Xbox 360 is hot stuff - so hot, in fact, that Major League Gaming has banned it from competition. Razer has long been known to PC gamers as a manufacturer of high-end mice, keyboards and other accessories, so it's no surprise that the Razer Onza, the company's first Xbox 360 controller, is a sweet piece of button-mashing kit. It features a 15-foot braided cable, analog sticks with adjustable tension, "Razer Hyperesponse technology" and a pair of programmable buttons that can be easily mapped to any function in the game. Razer actually bills the device as a "professional gaming controller," which is kind of ironic since at least one professional gaming league says the controller won't be allowed in competition. The problem, according to Major League Gaming rep "Killa KC," is those two programmable buttons. "The Onza controller will be illegal simply because of the two programmable buttons," he wrote in an MLG forum thread discussing the new controller. "The big issue with extra buttons is how easy it is to mod the controller without us being able to monitor it. Modders will be able to turn the extra buttons into rapid fire buttons or a macro like RRX. We cannot simply check every player's Onza controller to make sure they have not modded it," he continued. "Sure, someone could do that now with a Microsoft controller, but by doing that they are removing a default button on their controller. People pay a lot of money now for modded controllers with extra buttons that will rapid fire or macro. The Onza would make it impossible for us to monitor this on the circuit." The MLG community's response to the decision appears to be largely negative, with many questioning the rationale for the ban and pointing out that other controllers can also be "stealth modded" for non-standard functionality. MLG, however, placed the blame squarely on Razer, saying that it reached out to the manufacturer about the problem but was ignored. "I wish Razer would have listened to us and cared enough to make a version without the extra buttons, but they didn't," the rep added. In keeping with Razer tradition, the Onza is named after an aggressive, cougar-like wild cat. The legend of the onza can be traced back to the time of the Conquistadors in Mexico, but it is now considered a cryptid. The Razer Onza will retail for $49.99, but no release date has been set.